A ceremonial sword from Sri Lanka known as a kastane. The one-edged blade made of bronze inscribed with a dedication to Albert Edward, Prince of Wales from the donor. The hilt carved out of tortoiseshell and horn, which terminates in the head of a makara, a dragon-like mythical creature associated with Hindu iconography. The scabbard made of skilfully carved tortoiseshell plaques. 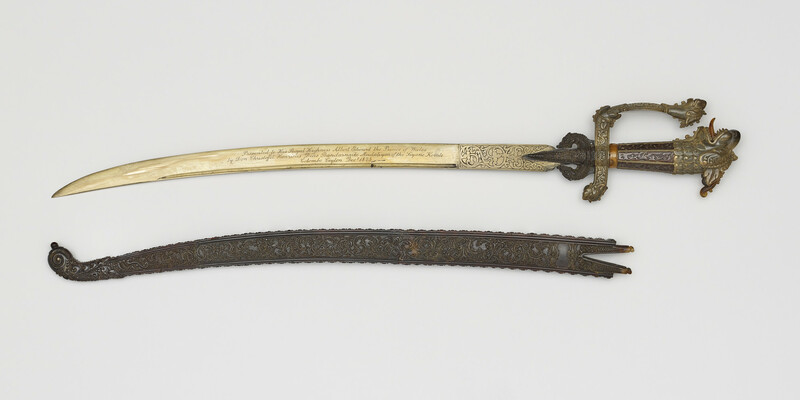 This type of sword was associated with the Kingdom of Kandy, where the rulers were patrons of workshops that specialised in making kastanes.